European Quality 16C 1/8" to 1" x 8ths Precision Round Collet Set-Includes 1 each of 1/8", 1/4", 3/8", 1/2", 5/8", 3/4", 7/8" & 1" Collet. Fractional Collet Range 5/64" to 1-5/8" x 64ths. External Thread: M47.5 x 1.75 RH. Internal Thread: 1-11/16 x 20 RH. Listings are described with detail information. Every listing or items have digital images from every angle from buyers perspective. 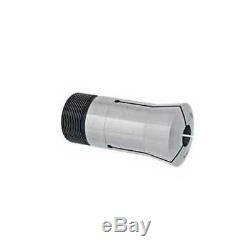 1/8 to 1 x 8ths 16C Precision Round Collet Set- 0.0004 Concentricity" is in sale since Friday, October 26, 2018. This item is in the category "Business & Industrial\CNC, Metalworking & Manufacturing\Workholding & Toolholding\Workholding\Collets". The seller is "hpcecs-online" and is located in Hamden, Connecticut. This item can be shipped worldwide.